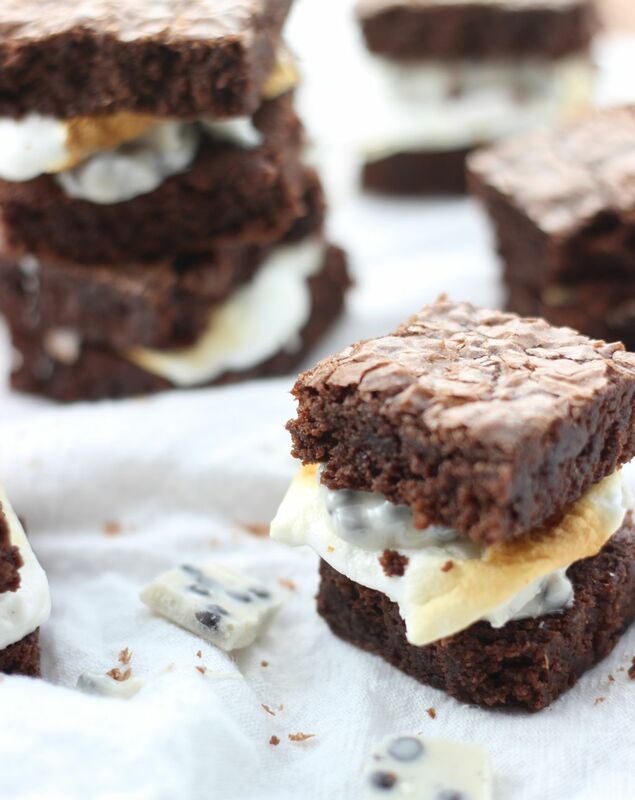 Toasted marshmallows and cookies ‘n cream chocolate sandwiched between two brownies. Here’s another s’mores recipe before I launch into a series about how I went crazy with chocolate chip cookie dough. 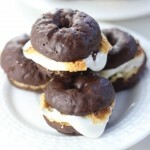 After making chocolate donut s’mores, I loved the idea of using something else nontraditional in place of graham crackers. The idea of brownies occurred to me. I know it’s very decadent, but that was kinda the point. Enter: boxed brownie mix. Fancy, huh? 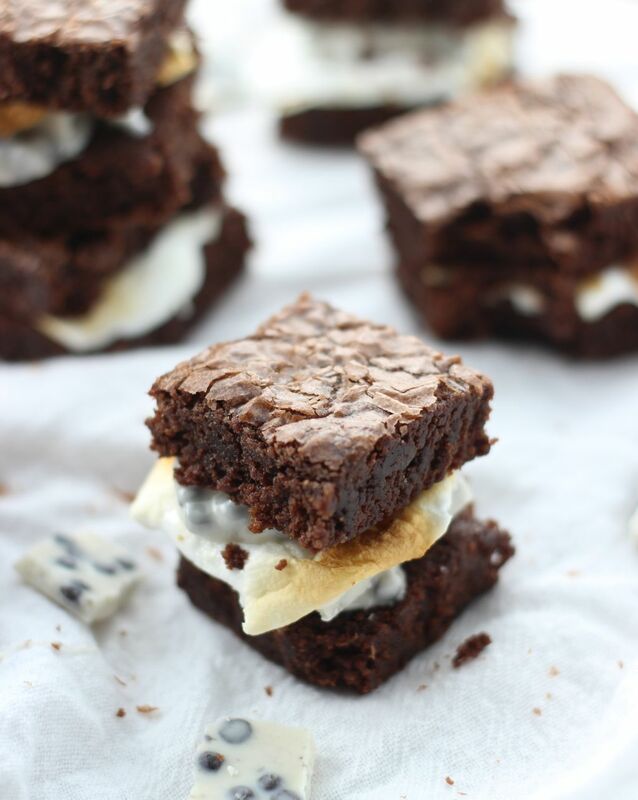 I honestly love box mix brownies and don’t feel compelled at all to make brownies from scratch. Just mix them up according to the package instructions, bake, and cut into bars. The usual drill. 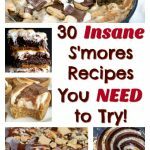 While we were going off the beaten path of traditional s’mores, I’d also spent part of the summer trying to figure out how I wanted to incorporate cookies ‘n cream chocolate into a s’mores recipe. I decided this was it. 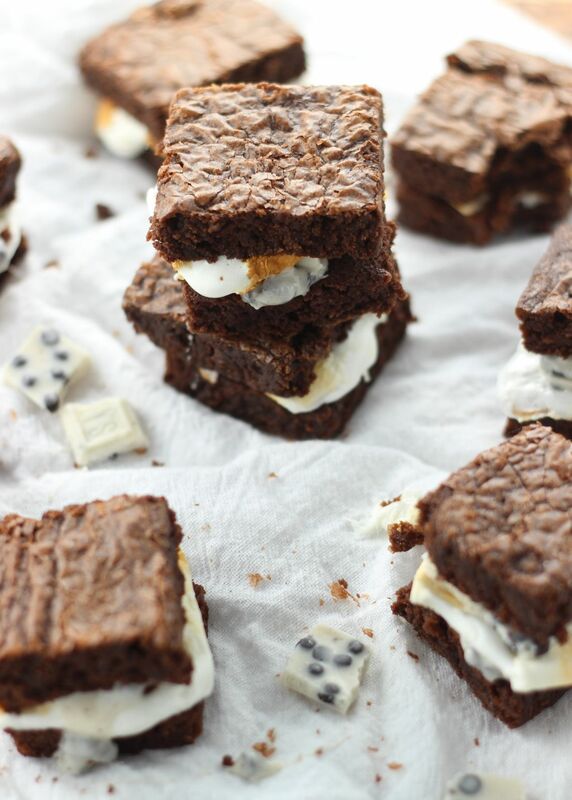 Throw a nice slab of cookies ‘n cream chocolate and a toasted marshmallow in between two brownies, and we’ve got a Cookies ‘n Cream Brownie S’more. 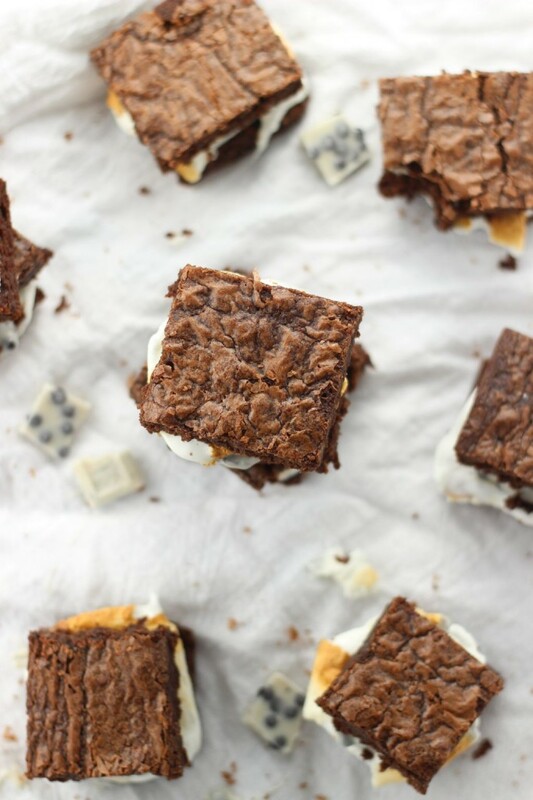 Your summer s’mores cravings are complete. 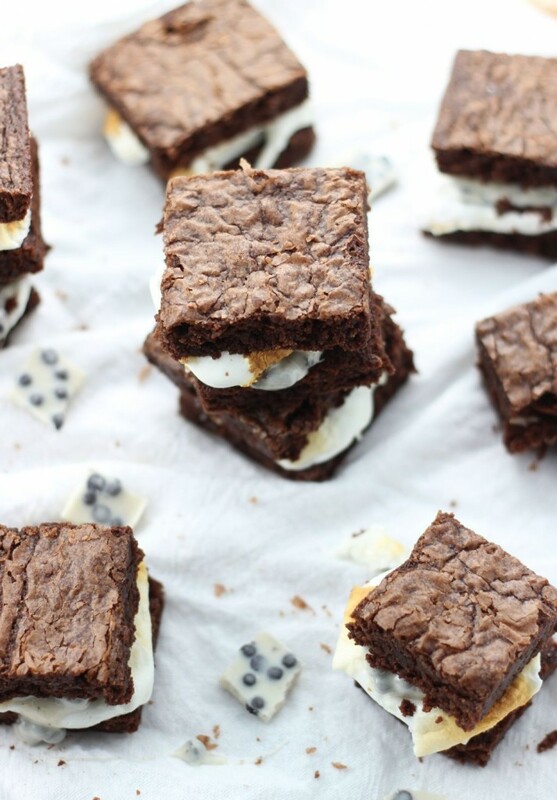 Toasted marshmallows and cookies n' cream chocolate sandwiched between two brownies. Prepare brownie mix according to package instructions for a 9x13 pan. For my brownie mix, I combined the brownie mix, water, vegetable oil, and egg. Bake at 350 degrees for 22-25 minutes, or until a toothpick inserted near center comes out clean. 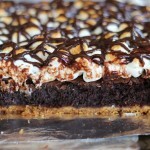 To assemble, place a piece of chocolate and a toasted marshmallow on the bottom of one side of a brownie. Top with another brownie. DEVOUR unabashedly! WHOA! 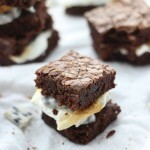 I love everything about these brownies!!! 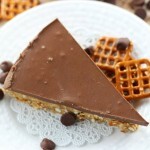 Decadent, delicious, and easy! Everything I love about dessert! These are awesome! So next level- so chocolatey! Wow, these do look delicious! I love recipes that begin with a mix. Thanks for sharing on Snickerdoodle Sunday. Pinned and Tweeted! Me too! I have no shame in taking the shortcut sometimes. Haha! Thank you! 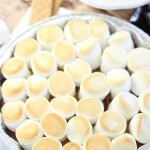 Now thats my kind of s’more!! 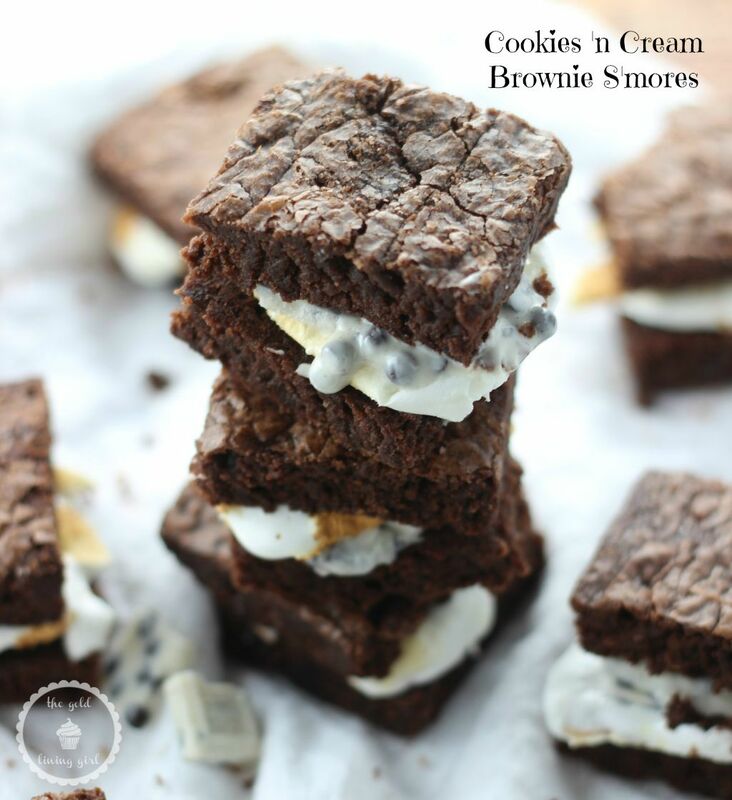 These look absolutely divine!! I cannot wait to try this! I would love it if you linked up to tonight’s Throw Back Thursday link party! Thanks so much for the invite! I’ll try to pop by later! These look delicious! I should not have looked at them while I was hungry. You’re brilliant! Oh, thank you!! I was trying to think outside the box. It was a fun recipe! These look so good! Thanks for sharing at the party. Pinned & shared. Hope to see you again soon.